Iprindole has been sold under the trade name Prondol by Wyeth in the United Kingdom and Ireland for the indication of major depressive disorder, and has also been sold as Galatur and Tertran by Wyeth as well. ^ a b c Rotzinger S, Bourin M, Akimoto Y, Coutts RT, Baker GB (August 1999). = 0272-4340&volume = 19&page = 427 "Metabolism of some "second"- and "fourth"-generation antidepressants: iprindole, viloxazine, bupropion, mianserin, maprotiline, trazodone, nefazodone, and venlafaxine" (PDF). Cellular and Molecular Neurobiology 19 (4): 427–42. ^ Caillé G, de Montigny C, Besner JG (1982). "Quantitation of iprindole in plasma by GLC". Biopharmaceutics & Drug Disposition 3 (1): 11–7. ^ Sisenwine SF, Tio CO, Ruelius HW (April 1979). "The disposition of [14C]iprindole in man, dog, miniature swine, rhesus monkey and rat". Xenobiotica 9 (4): 237–46. ^ a b Ayd, Frank J. (2000). Lexicon of psychiatry, neurology, and the neurosciences. Philadelphia, Pa: Lippincott-Williams & Wilkins. ^ Dictionary of organic compounds. London: Chapman & Hall. 1996. ^ Davison, Gerald C.; Hooley, Jill M.; Neale, John M. (1989). Readings in abnormal psychology. New York: Wiley. ^ a b "Jaundice from iprindole (Prondol)". Drug and Therapeutics Bulletin 9 (3): 10–1. January 1971. ^ Horn AS, Trace RC (January 1983). "Second generation antidepressants: The pharmacological and clinical significance of selected examples". Drug Development Research 3 (3): 203–211. ^ a b Zis AP, Goodwin FK (September 1979). "Novel antidepressants and the biogenic amine hypothesis of depression. The case for iprindole and mianserin". Archives of General Psychiatry 36 (10): 1097–1107. ^ Horn AS, Trace RC (July 1974). "Structure-activity relations for the inhibition of 5-hydroxytryptamine uptake by tricyclic antidepressants into synaptosomes from serotoninergic neurones in rat brain homogenates". ^ a b c Progress in medicinal chemistry - Google Books. ^ a b Rickels K, Chung HR, Csanalosi I, Sablosky L, Simon JH (September 1973). "Iprindole and imipramine in non-psychotic depressed out-patients". The British Journal of Psychiatry : the Journal of Mental Science 123 (574): 329–39. ^ Sean C. Sweetman (2009). Martindale: The Complete Drug Reference, 36th Edition. London: Pharmaceutical Press. ^ Baxter BL, Gluckman MI (August 1969). "Iprindole: an antidepressant which does not block REM sleep". Nature 223 (5207): 750–2. ^ Wander TJ, Nelson A, Okazaki H, Richelson E (December 1986). "Antagonism by antidepressants of serotonin S1 and S2 receptors of normal human brain in vitro". European Journal of Pharmacology 132 (2-3): 115–21. ^ a b Pälvimäki EP, Roth BL, Majasuo H, et al. (August 1996). "Interactions of selective serotonin reuptake inhibitors with the serotonin 5-HT2c receptor". Psychopharmacology 126 (3): 234–40. ^ a b Darvesh AS, Shankaran M, Gudelsky GA (April 2002). "3,4-Methylenedioxymethamphetamine produces glycogenolysis and increases the extracellular concentration of glucose in the rat brain". The Journal of Pharmacology and Experimental Therapeutics 301 (1): 138–44. ^ a b Bevan P, Bradshaw CM, Szabadi E (September 1975). "Effects of iprindole on responses of single cortical and caudate neurones to monoamines and acetylcholine". British Journal of Pharmacology 55 (1): 17–25. ^ a b Nagayama H, Hingtgen JN, Aprison MH (July 1981). "Postsynaptic action by four antidepressive drugs in an animal model of depression". Pharmacology, Biochemistry, and Behavior 15 (1): 125–30. ^ a b c Richelson E, Nelson A (July 1984). "Antagonism by antidepressants of neurotransmitter receptors of normal human brain in vitro". The Journal of Pharmacology and Experimental Therapeutics 230 (1): 94–102. ^ García-Sevilla JA, Hollingsworth PJ, Smnith CB (September 1981). "Alpha 2-adrenoreceptors on human platelets: selective labelling by [3H]clonidine and [3H]yohimbine and competitive inhibition by antidepressant drugs". European Journal of Pharmacology 74 (4): 329–41. ^ Kanba S, Richelson E (June 1984). "Histamine H1 receptors in human brain labelled with [3H]doxepin". Brain Research 304 (1): 1–7. ^ Hall H, Ogren SO (February 1984). "Effects of antidepressant drugs on histamine-H1 receptors in the brain". Life Sciences 34 (6): 597–605. ^ Onodera K, Ogura Y (January 1984). "Effects of histaminergic drugs on muricide induced by thiamine deficiency". Japanese Journal of Pharmacology 34 (1): 15–21. ^ Tsai BS, Yellin TO (November 1984). "Differences in the interaction of histamine H2 receptor antagonists and tricyclic antidepressants with adenylate cyclase from guinea pig gastric mucosa". ^ El-Fakahany E, Richelson E (January 1983). "Antagonism by antidepressants of muscarinic acetylcholine receptors of human brain". British Journal of Pharmacology 78 (1): 97–102. ^ Golds PR, Przyslo FR, Strange PG (March 1980). "The binding of some antidepressant drugs to brain muscarinic acetylcholine receptors". British Journal of Pharmacology 68 (3): 541–9. ^ Weinstock M, Cohen D (December 1976). "Tricyclic antidepressant drugs as antagonists of muscarinic receptors in sympathetic ganglia". European Journal of Pharmacology 40 (2): 321–8. ^ a b c Tatsumi M, Groshan K, Blakely RD, Richelson E (December 1997). "Pharmacological profile of antidepressants and related compounds at human monoamine transporters". European Journal of Pharmacology 340 (2-3): 249–58. ^ Bylund DB, Snyder SH (July 1976). "Beta adrenergic receptor binding in membrane preparations from mammalian brain". Molecular Pharmacology 12 (4): 568–80. ^ Ganry H, Bourin M (1988). "Is iprindole an indirect betamimetic drug?". Neuropsychobiology 20 (4): 187–93. ^ Ganry H, Bourin M (May 1993). "Has iprindole an alpha adrenergic activity?". Progress in Neuro-psychopharmacology & Biological Psychiatry 17 (3): 435–51. ^ Largent BL, Gundlach AL, Snyder SH (August 1984). 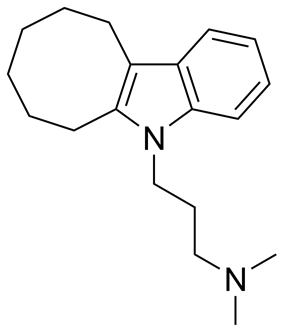 "Psychotomimetic opiate receptors labeled and visualized with (+)-[3H]3-(3-hydroxyphenyl)-N-(1-propyl)piperidine". Proceedings of the National Academy of Sciences of the United States of America 81 (15): 4983–7. ^ Wing, Lorna; Wing, J. K. (1982). Psychoses of uncertain aetiology. Cambridge, UK: Cambridge University Press. ^ Ajdukiewicz AB, Grainger J, Scheuer PJ, Sherlock S (September 1971). "Jaundice due to iprindole". Gut 12 (9): 705–8. ^ Clift AD (June 1971). "Allergy to iprindole (Prondole) with hepatotoxicity". British Medical Journal 2 (5763): 712. ^ Sedlock ML, Ravitch J, Edwards DJ (August 1985). "The effects of imipramine and iprindole on the metabolism of octopamine in the rat". Neuropharmacology 24 (8): 705–8. ^ Hegadoren KM, Baker GB, Coutts RT, Dewhurst WG (March 1991). "Interactions of iprindole with fenfluramine metabolism in rat brain and liver". Journal of Psychiatry & Neuroscience : JPN 16 (1): 5–11. ^ Yamamoto T, Takano R, Egashira T, Yamanaka Y (November 1984). "Metabolism of methamphetamine, amphetamine and p-hydroxymethamphetamine by rat-liver microsomal preparations in vitro". Xenobiotica 14 (11): 867–75. ^ a b Coutts RT, Hussain MS, Baker GB (December 1991). "Effect of iprindole on the metabolism of trimipramine in the rat". Journal of Psychiatry & Neuroscience : JPN 16 (5): 272–5. ^ Aspeslet LJ, Baker GB, Coutts RT, Torok-Both GA (1994). "The effects of desipramine and iprindole on levels of enantiomers of fluoxetine in rat brain and urine". Chirality 6 (2): 86–90. ^ Fuller RW, Baker JC, Molloy BB (February 1977). "Biological disposition of rigid analogs of amphetamine". Journal of Pharmaceutical Sciences 66 (2): 271–2. ^ Fuller RW, Hemrick-Luecke S (July 1980). "Long-lasting depletion of striatal dopamine by a single injection of amphetamine in iprindole-treated rats". Science 209 (4453): 305–7. ^ Peat MA, Warren PF, Gibb JW (April 1983). "Effects of a single dose of methamphetamine and iprindole on the serotonergic and dopaminergic system of the rat brain". The Journal of Pharmacology and Experimental Therapeutics 225 (1): 126–31. ^ a b Cassidy S, Henry J (October 1987). "Fatal toxicity of antidepressant drugs in overdose". British Medical Journal (Clinical Research Ed.) 295 (6605): 1021–4. de Montigny C (1982). "Iprindole: a cornerstone in the neurobiological investigation of antidepressant treatments". Modern Problems of Pharmacopsychiatry 18: 102–16. Horn AS, Trace RC (January 1983). "Second generation antidepressants: The pharmacological and clinical significance of selected examples". Drug Development Research 3 (3): 203–211.